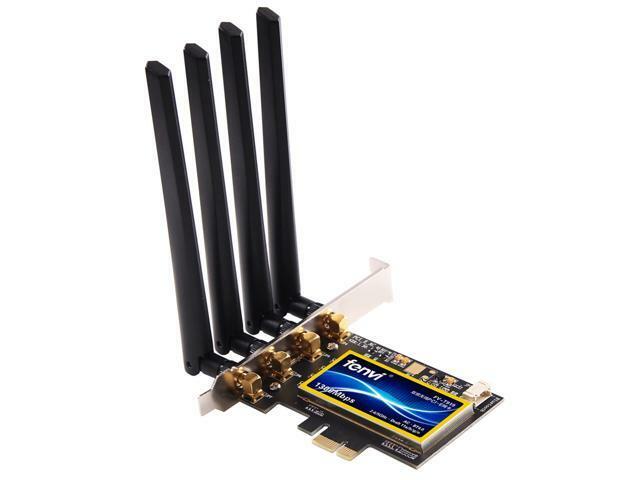 This chipset implements the 3-stream 802.11ac specification to enable speeds up to 1.3 Gbps in access points, routers, DSL/cable gateways and PC products. The single-chip dual-band transceiver integrates all the major functional blocks needed to implement a complete 802.11ac wireless sub-system, including radio, baseband and MAC. This highly integrated solution provides the increased coverage and throughput performance required for high quality video and media applications in the home and enterprise. 1.3 Gbps PHY rate performance offering over 3x performance Dual-band operation compatible with legacy 802.11n networks 80 MHz wide bandwidth that is 2x wider than current 802.11n solutions 256-QAM, a higher modulation scheme that increases data transfer efficiency 802.11ac-compliant transmit and receive Beamforming for extended coverage for 802.11ac and legacy devices. Low Density Parity Check (LDPC) Codes for increased rate at range PCI Express 2.0 host interface. Enhanced Bluetooth coexistence interface support for seamless BT + 5G WiFi operation. Note:Bluetooth function not work well on Mac OSX 10.12. Installation problem: If you have any problem, you can contact us, we can help you solve the problem, thank you. This item is covered by fenvi Official Store Return Policy. Pros: Its very nice looking works like a dream love the Bluetooth. Just know that you must update it or you can not connect to wifi. Pros: This item was the easiest part of my build. Coming from someone who has never built a PC; this was stress free addition to get wifi right out of the box. The device connected very easily for bluetooth as well. I look forward to buying their product for my next Hackintosh build. Cons: Flawless product for Hackintosh builder/user. Cons: First of all the official website claims this adapter works with windows 7 64 bit, it doesn't. Both drivers on the cd didn't work. Downloaded the drivers off the official website for windows 7 64 bit, the bluetooth driver installed and the wifi one gave me the same error as the cd "error "update.cpp 1185" has occured and setup cannot continue". Refuse to upgrade to windows 10 I'll be attempting to return this garbage chip. Total waste of my time. Cons: This is not a wireless AC adapter. Wireless N 300 speed tops. I've tried several firmwares in both Mac and Windows and I can't get the advertised speed. I know I've got the wifi speed, my 2012 Macbook and my Razer both get a 450mb connection. Other Thoughts: I would strongly advise against this card UNLESS you are building a Hackintosh. Pros: -Thing is solid. Came in about a week. -Holds speed darn close to what I have gotten hard-wired in the past! I get 90 MBPS through wire and I am a good 40-50 feet and upstairs in relation to my router and I get a solid 55-70!!!!! -Windows 10 needed drivers - note ones on CD are not good/did not work - their website drivers worked instantly, again, both Wifi and bluetooth and speeds are identical from Windows to Mac. Make sure to use antennas. Other Thoughts: -If you are into Hackintoshing and are looking for a solid dual-boot card, after connecting the USB header both WIFI and Bluetooth were solid out of the box for OSX. -Windows drivers (from site) are solid too. -I STRONGLY recommend this card.